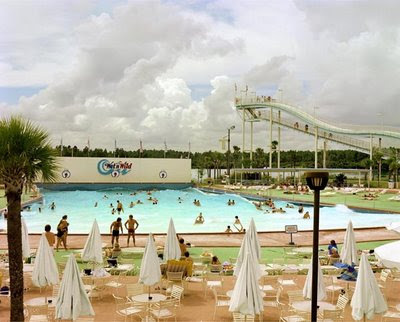 Joel Sternfeld, Wet´n Wild – Aquatic Theme Park, Orlando, Florida, September 1980. Qualcuno sa dirmi come mai da un paio di giorni ricevo decine di visite con la chiave di ricerca corrispondente a questa foto di Joel Sternfeld - e soprattutto provengono tutte dalla Germania (ma da diverse città)? Sono curioso (e con voglia di perdere un po' di tempo, forse). Anybody can explain to me why in the last few days I have been receiving tens of visits (and counting) through the google query of the above Joel Sternfeld's image, all from Germany (but from different towns)? I'm getting curious (and a bit willing to waste time, maybe). No no, the mystery was quickly solved: the German Filmschool in Berlin has published the application subjects for this year and one exercise is to analyse the picture of Sternfeld - they also linked the blog in the application paper, which had a reproduction of the image inside an interview with Joerg Colberg months ago. Easy explanation for the German invasion, hope someone will stay! I stayed, though I maybe won't apply. Thanks for a good read/view. Grazie.